Being one of the most exciting games available at casinos, the Roulette has garnered a lot of popularity over the years. Like any game of chance, there have been many who have attempted to find a surefire way of tipping the odds in favor of the player, rather than the house. The 2 most prominent roulette betting systems are the Martingale system and the Labouchère system. Both have their pros and cons, but it's nonetheless valuable to be familiar with both if you want to understand the mechanics behind them. The Martingale system is one of the most well known systems out there. In principal, it's based on doubling your previous bet each time you lose, and resetting to the initial bet should you win. For example, let's take an initial bet of $10. Assuming we win, our next bet will be $10 as well. If we lose, our next bet will be $20. If the round is won, our next bet will go back to $10. This will happen each time you win. If we lost, we will again double our bet in the next round to $40. The result of this system will be that each time we win, we will profit by the initial bet. No matter how many rounds we end up playing, once we win, our bankroll will increase by $10. There are a number of problems with these system. The first being that it's very easy to get to a very high bet should you lose a number of times in a row. You must have a big amount of money available if you choose to play with this system. The second problem arises from the casino's attempts to battle this strategy. This betting system is the cause for table limits. 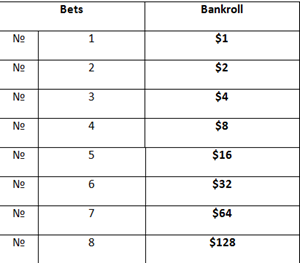 If the table has a minimum bet of $10 and a maximum bet of $500, you would hit that limit within 6 consecutive losses. The chances of this happening are quite high. Assuming you play 150 rounds, you have an 80% chance of losing 6 times in a row, which will leave a $630 dent in your bank roll. The third problem with using this system is the fact that it's very easy to spot. The casino will mark players attempting to use different betting systems as problematic players. Such players are more like to attempt card counting and other methods that casinos don't approve of. The second system, the Labouchère system, offers a much more stable betting system, but is rather complicated. In this system, the player must decide upon a certain amount of money they wish to make, and then make up a list of numbers that sum at the initial number. Once the list is done, the player will bet the sum of the first and last numbers on the list. If the bet is won, the 2 numbers will crossed out, and the player will move on to the next first and last pair of numbers. If a bet is lost, the player will add the amount lost to the end of the list. The next bet will be of amount he just lost and the first number of the list. This will be done until the list is completely crossed out, at which point your bank roll will be up by the initial amount you set out to earn. I know that it can be a little hard to follow, so I'll use an example. Let's say we chose $50 as our target profit. We'll make a list of numbers that sum up to that amount: 10, 20, 10, 5, 5. Our first bet will be the sum of the first and last numbers, meaning 10+5 = 15. If we won the round, we will cross out 10 and 5 from the list. If We've lost, we will not cross them out, but add 15 to the end of the list, turning it into 10, 20, 10, 5, 5, 15. Our next bet will the sum of the first and last numbers of the list, 10+15 = 25. If we win, 10 and 15 will be crossed out, if we lose, we will add 25 to the end of the list and continue on to the next round in the same fashion. The Labouchère system is not without it's flaws. First of all, it's much harder to learn. Second, it is possible to hit table limits, although it will take a little longer than the with the martingale system. You will also need a rather big bankroll for this system, because as I've stated earlier, you can lose quite a few times in row and in that case it can take a big chunk of your bankroll. Another problematic aspect of the Labouchère system is the fact that it's very easy to spot, because will have to have a pen and paper with to keep track of all of the bets you need to make. It's quite hard to keep track of the bets when you win a few rounds, then lose a few, win once, lose again and so on. And again, as stated before, casinos aren't very fond of players trying to beat the system. The internet is littered with many betting systems and software that will tell you how much and when to bet, assuring you tremendous profit. The truth is, that most of them don't even work. Those that do work are usually based around the 2 systems listed above. My suggestion would be to try both out, see how they work for you with low sums of money and avoid any risk.